Whether dressing to impress for a Halloween or Christmas party, think mean, green, and completely un-merry. 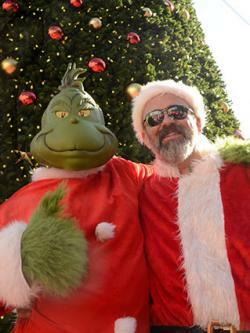 The big, fuzzy Grinch typically wore a bright red jacket and Santa hat, pointed elf shoes, and a menacing smirk. Choose from several incredible selections that are dead ringers of the mercenary, yet somehow likable, classic character from Dr. Seuss' How the Grinch Stole Christmas. Creating your own Grinch costume is an easy and fun go-to for your theme party, Halloween night, or Christmas event. With just a few simple materials, you can quickly transform into the bitter grump with the coldest of hearts. If sewing a Grinch costume isn't up your alley, try this easy DIY. The materials are available at your local craft store or, of course, online. The Grinch isn't himself without his sticky, furry fingers (which he uses to steal all the children's presents). You'll need an old pair of gloves (or green gloves), olive green faux fur, and super glue for fabric. Cut fur into 10 separate pieces, about four inches long and one inch wide. Glue these pieces along the finger of the glove, with just a touch hanging over the tip of the glove to create the look of long fingers. Cut two more pieces of fur that are two to three inches wide and long enough to fit around the wrist. Glue these pieces around the wrist part of the glove for a full fur effect. For the bottom portion of the costume, you can use tights, leggings, or pants, depending on your personal preference. Just make sure to opt for the Grinch's classic olive green hue. You'll also need olive green faux fur and fabric super glue. Cut out numerous square-shaped pieces of faux fur. Piece by piece, line the back edges of the fur with fabric glue and quickly place onto the pants, starting at the top. Working your way down the pant leg, make sure to align the edges of each piece of fur so that the pants are completely covered. To mischievously tip-toe around town, elf shoes are a necessity. These shoe covers are easy to make and require very few materials, some of which you may already have. Pick up red felt fabric, a needle and thread, and white pom-poms. Print off a free elf shoe pattern like the one from Valita's Designs & Fresh Folds. You will also need a pencil and scissors. Using a pencil, draw the shoe pattern onto the fabric. Fold the fabric in half and trace on the other side. The shape should consist of a long side several inches longer than your foot, a curved back with a straight ankle, and an upward-curling toe. Cut the two sides out. Keep the fabric folded so that when you cut along the lines, you're creating two of the same side, resulting in two separate shoe covers. Stitch together the right and left sides of each shoe, making sure to leave a space for your ankle. Stitch the bottom, then behind the heel, across the top, and around the toe. Then, attach the pom-pom to the tip of the toe with a couple stitches. Once you've finished your furry green hands and legs and made your elf shoes, you'll need to finish the outfit by picking up a Grinch mask with a suspicious smirk, a Santa coat of your liking with a big, black belt to match the Grinch, and a traditional Santa hat to top off the joyful (or rather, joyless) look. If you have a willing four-legged friend, make or buy a Max costume for him or her to wear. Though the Grinch's heart is two sizes too small, you will certainly be able to find a costume below that is a perfect fit for you or your little ones. The Grinch Earflap Hat & Diaper Cover: For just under $45, this warm, soft crocheted duo is perfect for your newborn girl or boy. The hat features a bright green pom-pom top, the Grinch's grin with his bright yellow eyes, and braided earflaps intertwining yellow, black, and green. The green diaper cover has two little buttons and a cute, yellow bow on the front. Rated five stars with over 535 reviews, this one's a steal. Just make sure you add weather-appropriate clothing (green sleeper, coat, and so on) if you plan to head outdoors with your little one donning the adorable outfit. 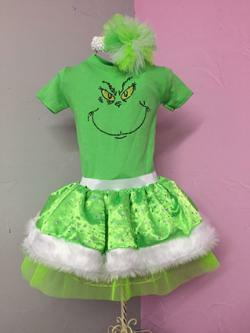 The Grinch Christmas Tutu Costume: This adorable, handmade item comes with a green top featuring a Grinch embellishment on the front in rhinestones. The green tutu adorned in silver sparkles is edged with white faux fur with green organza underneath while the matching green and white headband is the icing on the cake. It has several raving reviews, mostly noting the comfortable, high-quality material and fit, five stars, and is available for just under $32. Green Furry Jumpsuit: A different take on this classic costume, this furry, bright green jumpsuit screams Grinch and is available for just under $40. It's missing some of the main Grinch accessories, but all you'll need to do to be recognizable as the nasty creature is throw on a Santa hat and paint on a dark green nose and some big brows. It's easy, comfortable, and toasty enough to trek the trick or treating streets fearlessly... just like the Grinch would do. Just be careful to not steal anyone's candy. This is a good gender-netural option for boys or girls. Grinch Fuzzy Leg Warmers, Grinch Hoodie Hat, and Grinch Fuzzy Wrist Cuffs: Steal Christmas in style. The big, furry, and green knee-high leg warmers are just under $30, while the hoodie hat is under $22 and features the Grinch's scary, yellow eyes and two long, fuzzy, green pom-poms. Throw on a matching green shirt, some leggings, and the fuzzy wrist cuffs that cost under $10 for the perfect touch to this head-turning ensemble. Deluxe Grinch Costume: For under $92, this four-piece costume includes everything you need to transform into the resident grouch of Whoville. 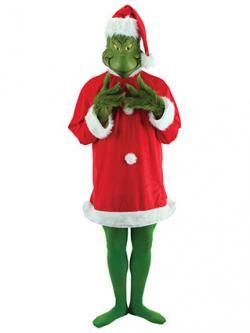 It comes with a Grinch Santa tunic, a Santa hat, a latex full over-the-head mask depicting the Grinch's evil smirk, and some matching green fur gloves. Add in some bright green tights, pointed elf shoes, and a revolting attitude and you'll be ready for your Halloween, Christmas, or holiday party. If you are in the spirit of the holiday season, or better yet, not, these original costume ideas for all ages and genders will inspire you to transform into the famous green character from How the Grinch Stole Christmas. And remember, though the reclusive green Grinch had high hopes of ruining Christmas in Whoville, don't forget the dreadful plans coming to an end when he encountered the endearing Cindy Lou Who. If you'd rather play the part with a little more of a cheerful, warm-hearted attitude, the choice is yours. Turn your sinister smirk into a sweet smile and take on the night.